IAB Medium Rectangle 300x250 Within Content Areas Ad Tag, HTML5, PNG, Animated GIF, JPG - up to 40k in size (under 30 seconds animation and 3 loops max). IAB Wide Skyscraper 160x600 Right or Left Nav Bar on Most Sites Ad Tag, HTML5, PNG, Animated GIF, JPG - up to 40k in size (under 30 seconds animation and 3 loops max). IAB Leaderboard 728x90 Top of Most Pages Ad Tag, HTML5, PNG, Animated GIF, JP - up to 40k in size (under 30 seconds animation and 3 loops max). IAB Large Rectangle 300x600 Within Content Areas Ad Tag, HTML5, PNG, Animated GIF, JPG - up to 40k in size (under 30 seconds animation and 3 loops max). Outstream In-Content Video 16:9 Aspect Ratio. 1280x720 and 15 (recommended), longer formats are accepted Runs within Content Section of websites VAST and VPAID Ad Tags. Hosted mp4, avi, mov (recommended) file formats. Maximum file size is 10M. Video Pre-Roll 16:9 Aspect Ratio. 1280x720 (recommended). 15 (recommended) or 30 seconds. Runs prior to Video Play VAST and VPAID Ad Tags. Hosted mp4, avi, mov (recommended) file formats. Maximum file size is 10M. Mobile App Video Interstitial (takeover) 16:9 Aspect Ratio, 1280x720 (recommended). 15 (recommended) or 30 seconds. Runs In Screen as Interstitial VAST ad tags. Hosted mp4, avi, mov file formats. Maximum hosted file size is 10M. Facebook Newsfeed Ad 1200 x 628 Headline: 25 character Max, Body Copy: 90 Characters Max. Social ads cannot be third party served. 85+% of image must not contain text. Use images without any words. JPG - up to 25k file size. Instagram Ad 1080 x 1080 125 character text Max. Social ads cannot be third party served. JPG - up to 25k file size. Native In Content Ad 1200 x 1200 Headline 30 characters of less. Caption 300 characters of less. Native ads cannot be third party served. JPG - up to 1M file size. 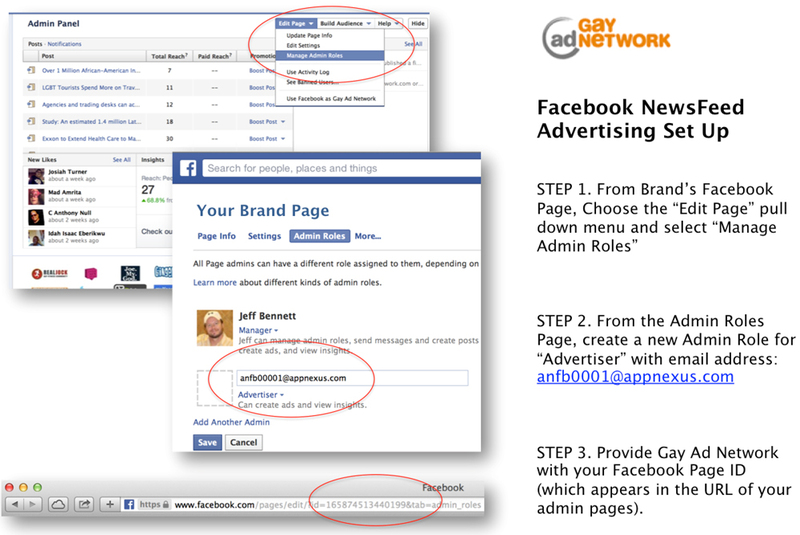 Gay Ad Network does not host HTML5 creative; third-party ad tags must be provided. Our approved third-party ad serving vendors are Sizmek and DoubleClick.